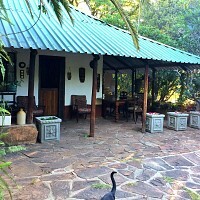 The Farmhouse was completed in 1952 and built as a replacement for the original mud and stone farm house built in 1902. As with most old style farmhouses a lot of additions have taken place over the years and recently the thatched roof was removed and the house was modernised but with a lot of emphasis on retaining the original structure and style. 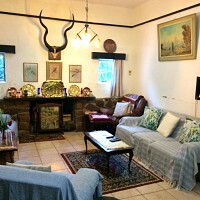 Due to a surge in demand we recently made the decision to incorporate the Farmhouse into our Lodge structure as either a self catering unit or B & B weekend getaway or mid week business accommodation. 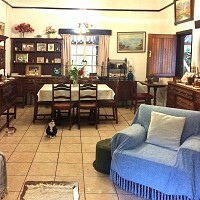 The mementos of years gone by are all in place with family photos and antique furniture. 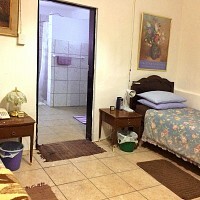 The main bedroom with en suite bathroom can be made up as 2 singles or 1 x king size bed, a second bedroom with separate bathroom has a double bed. 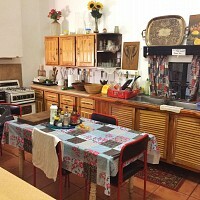 The kitchen is fully equipped and has upright fridge and freezer, microwave as well as a 6 plate Smeg stove and oven. 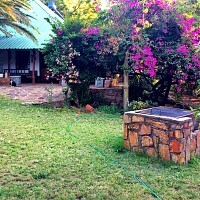 All the usual kitchen utensils are in place and a private braai area is in the garden. 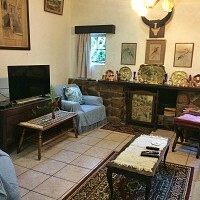 Full DSTV with linked TV in second bedroom. 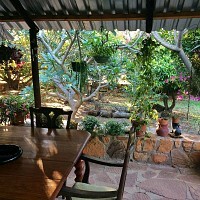 Access to our game farm via the walking trails is available to the guests, wildlife consisits of Blouwildebees, Zebra, Impala, Gemsbuck, Red Hartebees, Blesbuck, Waterbuck and Kudu as well as a lot of endemic game.